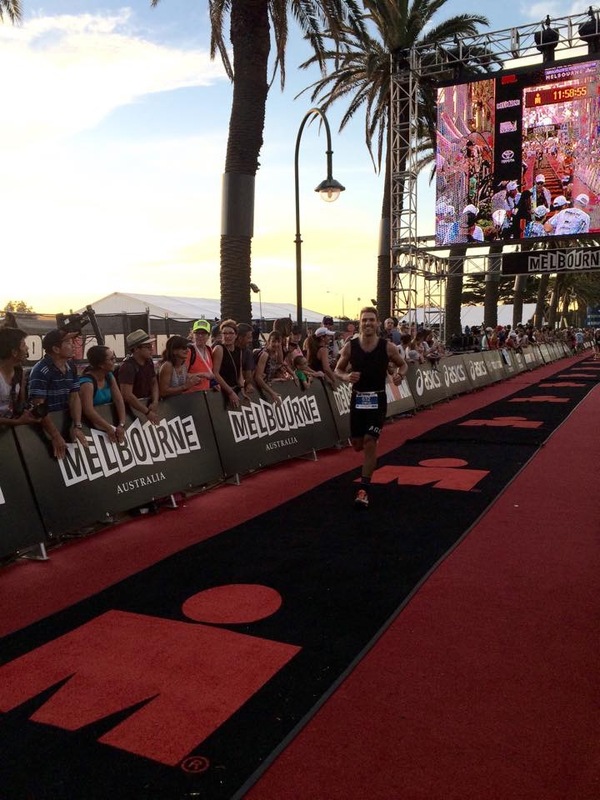 On the 22nd March, I completed my first Ironman. Ironman Melbourne has been on my upcoming event list since signing up in March 2014 and even though I had a year to prepare it felt like the date came around very quickly, especially the last 6 weeks, which seemed to fly by. Ironman is a world wide organisation hosting Full Distance (3.8km Swim / 180km Bike / 42.2km Run) and 70.3 (Half Distance) events seemingly everywhere and anywhere. “Anything is possible” is the official tag line and that is not specifically referring to the weather that will be found on course at the Melbourne event. This was the 5th Ironman Melbourne and each year has provided competitors with a different challenge in regards to the weather, including one year that had a shortened swim leg due to the excessively dangerous water conditions. The 2015 edition, was in stark, contrast a beautiful day. Arriving at Frankston at 6.30am to make final preparations to the bike and to ensure that we were at the starting line at time to relax as much as possible before embarking on a day of self discovery and challenge, we were greeted with glassy water conditions and a mild temperature which belied what was in store. A new rolling start policy in which each athletes time starts as you enter the water, rather than a frantic jostling for position as the hooter goes provides a more respectful and hassle free start as small groups of athletes (6-8) are released into the water at 10 second intervals. I was fortunate enough to bump into a familiar face in Tracy while lining up to race. It was her 6th Ironman (Ironperson?) event and she was fantastically calming and reassuring, It would turn out that she would win her age group and qualify to go to the Ironman World Championships in Kona, no wonder she was so calm, she was ready and excited to put on a show, I on the other hand was excited to see how the day would go. The swim leg makes up approximately 10% of the total event time and as such it is a real warm up into the event as a whole. The water sets the tone of self discovery. Most athletes complete this leg around the hour mark and its is an hour of contrast. There are people everywhere, swimming next to you, in front of you, behind you, all the while you are in your own world, flicking the arms over, in a cone of silence provided by the water. In my case there was 58 minutes of introspective thought. Questions and statements like, I hope I feel good after the swim, am i swimming as easily as possible?, why did I sign up to this event? How are there 2500 people also looking to test themselves out over such a long time? Is someone deliberately touching my feet or are they just clumsy? Just like that the swim leg is over. it’s as if the isolation from other stimuli puts you into a time warp, distorting the reality of an hour in the water and thrusting you out and into transition quicker than expected. Transition one in triathlons are a somewhat organised chaos, like a shift change at a large factory, people are trying to get out of there as quickly as possible and tunnel vision prevails. Wetsuit off, cap and goggles off, socks on, cycling shoes on, sunscreen on, helmet on, get bike, start riding. There is a weird sensation leaving transition one, an unusual emotion that is hard to pinpoint but stems from the knowledge that you are embarking on a 5-6 hour bike ride that is merely preceding a marathon run. It’s a time to break the rest of the event into little bite sized, achievable pieces. Ironman Melbourne is 2 laps of Eastlink from Frankston to Ringwood. Each north and south journey is a convenient 45km stint. The internal monologue of “45km until i turn around at Ringwood……thats just over and hour….seems pretty close…BEEP,BEEP,BEEP….thats the computer telling me to eat something……yum….40km until Ringwood…”. Other than turning the legs over and monitoring the effort required to keep the planned average speed going there are few things to distract your thought. Whoooomp, Whoooomp, Whoooomp, the familiar sound of a full disc wheel approaching helps to break the monotony of repetitive thoughts. One of the highlights of the bike leg is that being a long up and back course, there are constant opportunities to watch the race unfold around you. Looking out for mates competing and giving them a hoot as the go by in the opposite direction and watching the leading male and female professionals fly past heading the opposite way at speed that us mortals dream about. The bike is about focus, not letting the mind wander, self discipline to stay alert or risk causing an accident, or forgetting to eat or drink, which would lead to dire consequences later in the day. By the last section of the ride the Melbourne temperature, in combination with the concrete and asphalt of the freeway meant things were warming up significantly. Most athletes at this stage were starting to look a little like sweet baked goods, we all had what looked like a dusting of icing sugar, from the sweat that was rapidly evaporating from our race kits, yep, it was hot. Transition two is a more orderly affair than T1, however 2 out of 3 people look like they are midway through a night out on the town, as your muscles adjust from the bike to running, it is a plethora of gaits that John Cleese would admit into his Ministry of Funny Walks. Bike shoes off, running shoes on, more sunscreen, visor, sunnies, run. The marathon of an Ironman is broken up into fun sized 1km servings for you. Clearly labeled throughout it does little to inspire or motivate, in some ways it makes the first half of the run seem elongated and infinite. Melbourne’s run course is a one way affair from Frankston to St Kilda. From Frankston, the building of the Melbourne CBD look mighty small, and mighty distant. The 3km to 18km section of the run leg is a pounding stretch along the Nepean highway, a mostly straight, mostly suburban, mostly cambered route that slopes relentlessly from right to left. To add insult the water is at most 100m from the road at any time, but due to the beachside housing it is rarely in view and provides no respite from the heat reflected from the numerous apartments and shopfronts along this section of the course. Mordialloc is literally a breath of fresh air, the path runs along the beachside promenade for a healthy 10km at this point and the proximity of the water cools the environment substantially. The mental anguish of the Nepean Highway is forgotten and the beauty of Melbourne is really on show, lovely bayside beaches, a green and shady path to run along and spectators galore adorn the streets from here until the finish. They say that the Ironman doesn’t start until 25km into the run, however i feel like the Ironman starts to finish at the 32km point. There is certain self belief that you feel when you hit single digits of distance left that reinforces the accomplishment and inspires to keep you going when the race is really at its physically toughest point. The volunteer aid stations and crowds along the final 10kms really remove the internal locus of control and demand that you keep pushing and testing your own limits in this stretch to the finish line. Complete strangers go completely nuts to will you along towards your own personal achievement. The finishing chute of such an event is a unique experience that you have to earn, and you pay dearly for. The day’s effort is merely the representation of a long preparation process that takes commitment, and dedication. It is the culmination of all the good and bad training sessions, the injuries and recovery, the early mornings and time away from loved ones, the highs and lows of your own journey and and that of your friends. My aim for the day was to enjoy the experience and smile as much as possible, I think i achieved this and learnt a little more about myself in the process. Total Time – 11 Hours, 31 Mins, 46 Seconds. Olivia, for the overwhelming support and encouragement, for keeping me on the straight and narrow and ensuring I kept getting up for those morning training sessions. Matt, for talking me into doing the event and for being such a great training partner. Kudos for beating your previous IM time and thanks for being such a help on my journey. Simon, for also talking me into doing it and being able to run sections of the event with you was a massive positive of my day. Penny, Tom, Tenille, Mike and Trish, Simon A, and everyone else who supported, messaged and congratulated, I thank you all.